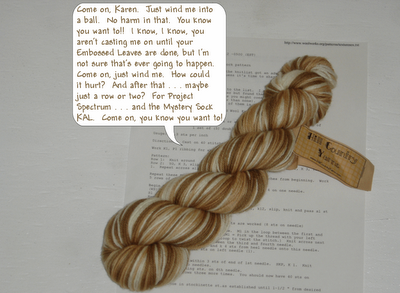 Musings of a (mostly) Self-Taught Knitter: Yarn speaks to me. Oh this yarn is such a bad influence. I'll try to stay strong though. LOL. I just had this giant hank (900 yards of cotton chenille) bring it to work today so I can get it wound up into a giant cake for a Clapotis! Great minds think alike... And I fixed my site; hubby set the registration up to deter spammers. Sorry! Wow! You are way stronger than I am. Resisting Hill Country? That takes strength. Well I couldn't resist that! So pretty. Wind it, Karen, wind it! I just got some Hill Country Yarn on Monday myself, and it's already in a cake. Last night at yoga I had an epiphany for the kind of pattern I want to devise for the socks. Hopefully I'll be casting on this weekend! It is gorgeous yarn. A little wind wouldn't hurt would it??? Awfully purty, but it ain't Koigu :-) You must resist!! You know, that yarn is awful convincing! I would have caved in by now! You are so strong to have resisted! Maybe a you should listen to the yarn. It would be a great yarn to work with for Project Spectrum! Dont listen to it! Once you have wound it into a ball it will keep stalking you!!! Oh heck, that yarn is lovely, wind away and cast on. I finally finished a pair of Jaywalkers that took two months to complete! It was slow and unenjoyable knitting. I say have fun. The browns are lovely too. Karen, you are hilarious! It must be the yarn making you delirious!!! BTW, I happen to love the country hills yarn - its BEEEAUUUTIFUL! Glad to see you wound it up, for Project Spectrum, of course. I have yarn it my stash that I just love to look at in hank form. I'm afraid I won't like it better in a ball, LOL!